Waste Bin Capacity: 28 gal. Formax OnSite FD 8402CC Office Shredder is built to the highest standards for operator convenience, safety and reliability. This cross-cut model features an easy-to-use LED control panel which puts commercial-grade power right at your fingertips. Heat-treated steel blades, a steel cabinet, lifetime guaranteed waste bin, and a powerful AC geared-motor ensure years of reliable performance and information security in your office environment. The new optional EvenFlow Semi-Automatic Oiling System helps to keep the FD 8402 in peak operating condition. Part number FD8402CC. Shred Size: 5/32" x 1-1/5"
Lifetime limited warranty on cutting heads. 1-year warranty on all other parts. FORMAX FD 8400CC Office Shredder. Commercial Grade Features: Metal Cabinet. Steel Gears. Heavy Duty AC Motor. LED Control Panel. Cross Cut shred up to 20 sheets in one pass. User friendly control panel with LED Load Indicator. Auto Reverse is activated if the shredder is overloaded. Lifetime guaranteed high-density plastic wastebin. The Formax FD 8400CC aims to offer small to medium offices FACTA-level security, easy maintenance and impressive sheet capacity. Here is a closer look at some of the strengths and weaknesses of the Formax FD 8400CC. The FD 8400CC has to be one of the more easy to use shredders on the market. One of the most convenient features is the optical sensor that's placed in the paper feed that is able to detect when there is paper placed into slot, and starts and stops the shredder automatically. This allows for easy "walk away" operation, enhancing your overall productivity. The machine also features a manual button that the user can activate when he or she are shredding lighter materials which the sensor may not be able to detect. Our testers loved the easy to decipher LED control panel, and really appreciated the well-illuminated load indicator light that lets you know when the shredder is operating at peak capacity and helps you to prevent overfeeding. The FD 8400CC's motor claims to operate at 30 feet per minute, with a nice sheet capacity of 20 sheets per pass. Our testers found that the shredder could operate at very near that capacity without any problems. It's important to note, however, that capacity will vary depending on your power source, the paper stock you are shredding and the relative humidity where you live. You should find this machine to be a great performer no matter the conditions, however. Level 3 cross cut shredding is very secure, and is what is required by law when you are discarding certain kinds of financial and personal information of your employees and customers. The laws were passed to combat ID theft and other types of consumer fraud, and failing to comply can lead to fines and civil suits. The FD 8400CC gives you a great tool to protect you, your business, and the information with which you are entrusted. 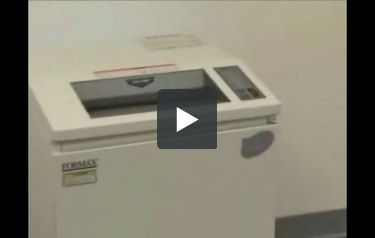 The FD 8400CC is also one of the easiest to maintain shredders that we have found. A lot of people aren't aware that a shredder's blades need to be oiled periodically to ensure peak function, but the FD 8400CC's control panel has a special indicator which flashes when the cutting heads are in need of lubrication (the process can be made even easier with the purchase of Formax's automatic oiling system) Another way to keep the blades in great shape is to utilize the FD 8400CC's automatic cleaning system that runs the heads in reverse to clear them of paper particles that have collected over time. Perhaps most remarkable of all, however, is the self-diagnosing system that records the details of your usage patterns and can relay them to technicians to assist them during service calls. The cutting heads of the FD 8400CC are solid steel and are under manufacturer's warranty for the life of the shredder. Though the FD 8400CC works hard, it may not be rated for continuous use. The machine has what is called "thermal overload protection," which is a handy function, but all it means it that the machine will shut itself off when there is a danger of overheating. We ran into no problems during our testing. However, high volume users may want to choose a shredder with a continuous duty motor. Shred Size 5/32" x 1-1/5" 1/4" 5/32" x 1-1/5" 5/32" 5/32" x 1-1/5" 5/32" x 1-1/5" 1/4" 5/32" x 1 19/32" 5/32" x 1-5/8"
Feed Opening 12.2" 12.2" 16" 16" 16" 16" 9.4"
Dimensions (W x x H): 20" x 20" x 34" 20" x 20" x 34" 24" x 20" x 35" 24" x 20" x 35" 24" x 20" x 35" 24" x 20" x 35" 24" x 20" x 35" 28" x 24" x 43" 20" x 20" x 36"